Diet Drinks Vs Regular Beverages: WHICH IS WORSE FOR YOUR HEALTH? Have you switched to diet drinks from regular ones considering your weight or calorie intake? It probably is not the right choice. The reason is drinking diet beverages harms your body and will only result in more weight gain. Although diet beverages are calorie free, they are added with artificial sweetener called aspartame, which is reportedly 200 times sweeter than table sugar. This chemical adversely affects many body functions. 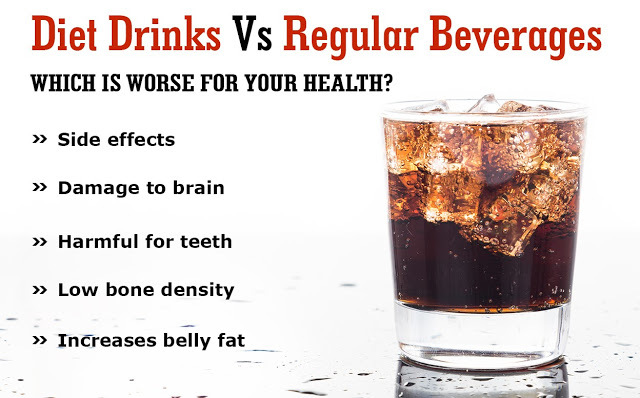 Effects of diet beverages on the body in this list might suggest why you should continue your regular beverages occasionally, instead of shifting to diet drinks. According to studies, the people who drank diet beverages showed increased waist size than the ones who drank the regular sugar drinks. The reason is believed to be the artificial sweetener and changed attitude towards food habits as the diet beverages easily justify high calorie food like burger, fries etc. in turn. This is a concern as increased visceral fat, a body fat stored within the abdominal cavity, is associated with increased risk of heart diseases and type 2 diabetes, the most common diabetes related to problems with insulin regulating the blood sugar. Aspartame is also known to damage brain by affecting the nerve cells and nerve endings in the cerebellum which are important for motor skills. Drinking diet drinks lead to low bone mineral density and osteoporosis especially in females. Pelvic bone most commonly affects in women by regular consumption of diet beverages. The diet beverages also contain large volume of citric acid, which causes tooth erosion destroying tooth enamel in the regular users. The risk is comparatively less in the regular sugar drinks users. As aspartame may also interfere with different activities of the brain, there are many side effects of diet drinks like headache, change in vision, vomiting, abdominal pain, diarrhea, memory loss, depression etc.